The most iconic love story of all time, Shakespeare's Romeo and Juliet is an epic-scale tragedy of desire and revenge. Despite the bitter rivalry that exists between their families, Romeo Montague and Juliet Capulet have fallen madly in love. But when the long-running rivalry boils over into murder, the young couple must embark on a dangerous and deadly mission to preserve their love at any cost. An L.A. Theatre Works full-cast performance featuring Calista Flockhart as Juliet; Matthew Wolf as Romeo; Julie White as Nurse; Alan Mandell as Friar Laurence; Richard Chamberlain as Prince Escalus; Nicholas Hormann as Lord Capulet; Josh Stamberg as Mercutio; Mark J. Sullivan as Benvolio and others; Logan Fahey as Tybalt and Balthasar; Alfred Molina as Chorus; Henry Clarke as Paris and others; Lily Knight as Lady Capulet; Janine Barris as Young Lady, Boy Page to Paris and others; Darren Richardson as Sampson and Peter; Alan Shearman as Lord Montague and others; André Sogliuzzo as Gregory and others; and Sarah Zimmerman as Lady Montague and others. Directed by Martin Jarvis. Recorded at the Invisible Studios, West Hollywood in January, 2012. It has been 45 years since I read this play. I have seen a couple movies based on the play but they really didn't to it justice. I found this audio book to present the play in an authentic, dynamic manner. I appreciate the cast and their wonderful work. So much better to hear then to simply read. I was hesitant to start this audiobook because when I have seen Shakespeare written before I honestly found it a bit offputting. But, I've heard before that it was originally penned to be preformed - that it doesn't work nearly as well, in tempo of language or action when it's just words sitting on a page that you look at. And after hearing this - straight through all at once - I entirely agree. I'm off now to explore what other plays audible has by this theater group. This is a classic tale of romance, passion, and its victims done right. It has a top notch cast that makes it a thoroughly enjoyable listen. A part of star-cross'd lovers take their life. 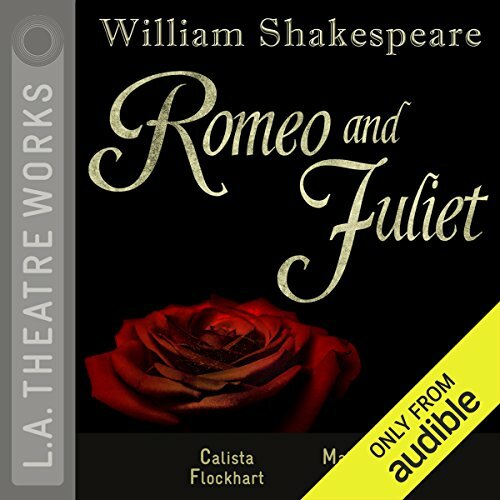 Would you consider the audio edition of Romeo and Juliet to be better than the print version? Yes! I've been teaching Romeo and Juliet to 9th graders for a few years, and this year I finally decided to use an audiobook in class for some scenes instead of having students read it aloud. It's been so helpful already! It's good for the students to read it aloud themselves sometimes too, but hearing it the way it was meant to be read has really helped their understanding of the play and their engagement in the story. I am enjoying this version; it is well-performed and has captured and kept my students' attention. loved every minute of it. I can't wait to hear it again. performance unmatched for a audio book. There isn't much to say that hasn't already been said many, many times--Shakespeare is a master, this is one of his masterworks and the cast did a fantastic job. this was the first time in 40 years that I truly appreciated the cheekiness of Shakespeare. the performers did an excellent job. I just don't see why people are still so hung up on "Romeo and Juliet"! I really enjoyed the performances in this, but with so many male characters around the same age and with such similar voices, it was difficult to know at times who was speaking. If I were to venture this again, I'd have the script in front of me.